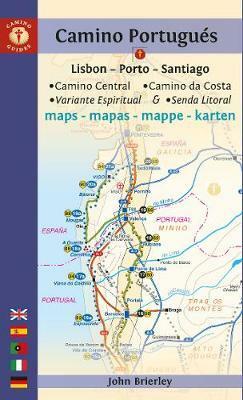 Spiritual seekers and travelers will find all the resources they need to walk the Way of St. James in this complete set of maps and town plans covering the sacred route from Lisbon, via Porto, to Santiago de Compostella, including the alternate coastal route. The 2020 edition also includes a Spiritual Variant and a Littoral Path.This newly updated, portable travel companion is light enough to carry while walking long distances each day and contains maps with locations of all pilgrim hostels, the distances between villages, and points of interest, as well as alternative routes and accommodations. The entire guide is provided in three languages: English, Spanish and Portuguese. John Brierley is a former charter surveyor and the author of "A Pilgrim's Guide to Camino de Santiago", "A Camino Pilgrim's Guide Sarria - Santiago - Finisterre", and "A Pilgrim's Guide to Camino Portugues".